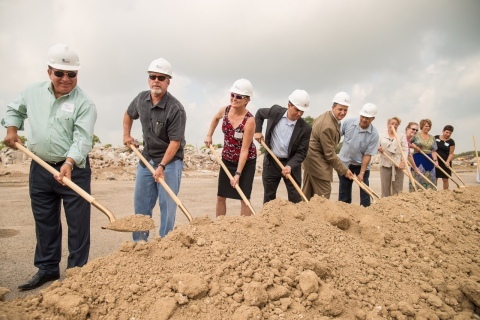 CORPUS CHRISTI, Texas--(BUSINESS WIRE)--Local dignitaries today joined representatives from the Federal Home Loan Bank of Dallas (FHLB Dallas), Wells Fargo, and Prospera Housing Community Services for the groundbreaking of the Glenoak Apartments in Corpus Christi’s Flour Bluff neighborhood. The $14 million project was awarded a $476,000 Affordable Housing Program (AHP) grant in 2015 from FHLB Dallas and Wells Fargo, which provided gap funding for the development of the 68-unit complex. Today’s attendees included Luis Buentello, field representative for U.S. Representative Blake Farenthhold (27th District), Texas House Representative Todd Hunter (District 32), Nueces County Commissioner Brent Chesney (Precinct 4), Councilman Rudy Garza (District 5), and Councilwoman and Mayor Pro Tem Colleen McIntyre (District 4). “When I learned of this project, I was very excited because it was an opportunity to provide quality affordable housing to the Flour Bluff community,” said Mayor Pro Tem McIntyre. Current residents of the Glenoak Apartments will be temporarily relocated while the complex undergoes a complete demolition and reconstruction. The new apartments are expected to open in June 2017. FHLB Dallas annually returns 10 percent of its profits in the form of AHP grants to the communities served by its member institutions such as Wells Fargo. AHP grants fund a variety of projects, including home rehabilitation and modifications for low-income, elderly, and special-needs residents; down payment and closing cost assistance for qualified first-time homebuyers; and the construction of low-income, multifamily rental communities, and single-family homes. This year, FHLB Dallas awarded $7.8 million in AHP grants to 27 projects that will result in 1,499 new or renovated housing units in Arkansas, Louisiana, Mississippi, New Mexico, and Texas. Since 1990, FHLB Dallas has awarded more than $245 million in AHP and AHP-funded grants to assist more than 45,500 families. Wells Fargo & Company (NYSE: WFC) is a nationwide, diversified, community-based financial services company with $1.7 trillion in assets. Founded in 1852 and headquartered in San Francisco, Wells Fargo provides banking, insurance, investments, mortgage, and consumer and commercial finance through more than 8,700 locations, 12,500 ATMs, and the internet (wellsfargo.com) and mobile banking, and has offices in 36 countries to support customers who conduct business in the global economy. With approximately 266,000 team members, Wells Fargo serves one in three households in the United States. Wells Fargo & Company was ranked No. 30 on Fortune’s 2015 rankings of America’s largest corporations. Wells Fargo’s vision is to satisfy all our customers’ financial needs and help them succeed financially. Wells Fargo perspectives are also available at Wells Fargo Blogs and Wells Fargo Stories. The Federal Home Loan Bank of Dallas is one of 11 district banks in the FHLBank system created by Congress in 1932. FHLB Dallas, with total assets of $54.4 billion as of June 30, 2016, is a member-owned cooperative that supports housing and community development by providing competitively priced advances and other credit products to approximately 850 members and associated institutions in Arkansas, Louisiana, Mississippi, New Mexico, and Texas. Visit fhlb.com for more information. FHLB Dallas and Wells Fargo representatives joined in the August 11 groundbreaking of the Glenoak Apartments in Corpus Christi, TX. The $14M project was awarded a $476K grant in 2015 from the banks.